Galbraith welcomes new surveyors to its expanding building surveying and commercial divisions and is also delighted to announce that four members of staff have passed their final RICS Assessment of Professional Competence. Galbraith has appointed new surveyors to its expanding building surveying and commercial divisions. We are delighted to have Simon on board to strengthen our department based in Stirling and increase our capacity to deliver building surveying services across Scotland and further afield. This appointment confirms our strategy to continually boost the building surveying department across Galbraith. Lucy Yates has also been appointed to the Stirling office as a graduate commercial surveyor having recently completed a master’s degree in Real Estate Management at Heriot Watt University. Lucy will be working on commercial agency, valuation and development projects. Jay Skinner joins the Galbraith commercial team in Edinburgh as a planner, providing guidance and advice to a range of clients as well as supporting the growth of the firm’s planning services. 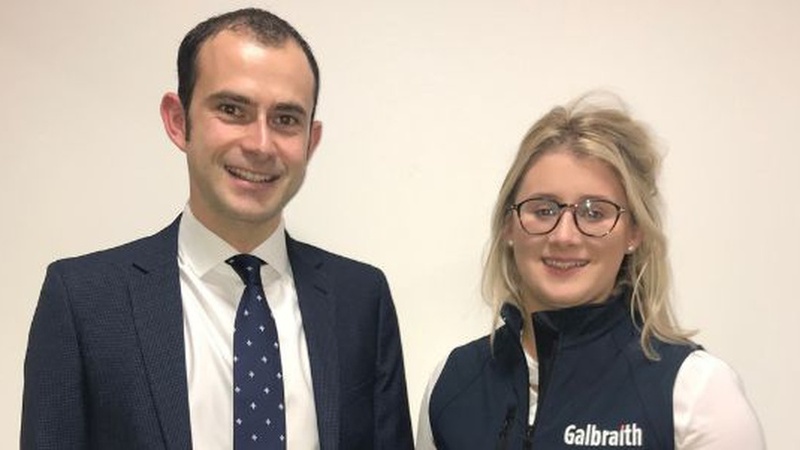 In addition, Galbraith is also celebrating professional success for four young members of staff who have passed their professional qualifications through the Royal Institution of Chartered Surveyors. This includes two newly qualified commercial surveyors in its Edinburgh office: Jamie Addison-Scott and Emma MacFadyen; and in addition two newly qualified rural surveyors Jennifer Jeffrey, (Edinburgh) and Isla King (Aberdeen), all of whom successfully passed their Assessment of Professional Competence recently and are now members of the Royal Institution of Chartered Surveyors. Galbraith has provided me with a wide range of training, which was essential in being able to successfully navigate my way through the APC process. My training ranged from property management to transactional work, with all members of the team providing a high level of support throughout. I am delighted to have become a member of RICS and look forward to this next step in my career. I am delighted to have become a member of RICS following the culmination of the APC and my academic studies. The support from the Galbraith rural team and the extensive array of professional work I have undertaken to date was key to my success. I look forward to continuing to develop my expertise and offer exceptional service to our clients.